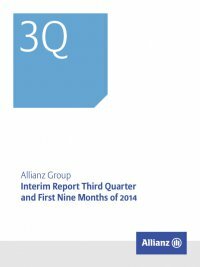 Interim Report Third Quarter and First Nine Months of 2014 Allianz Group32 Corporate and Other Third quarter 2014 Operating loss increased by € 19 mn to € 248 mn, driven by Holding & Treasury. Business segment overview Corporate and Other encompasses the reportable segments Holding & Treasury, Banking and Alternative Invest­ments. Hold­ ing & Treasury includes the management of and support for ­Allianz Group businesses through its strategy, risk, corporate finance, treasury, financial reporting, controlling, communica­ tion, legal, human resources and technology functions. Our banking products offered in Germany, Italy, France, the Nether­ lands and Bulgaria complement our insurance product port­folio. We also provide global alternative investment management services in the private equity, real estate, renewable energy and infrastructure sectors, mainly on behalf of the ­Allianz Group. Key figures Key figures Corporate and Other1 € mn three months ended 30 September 2014 2013 Operating revenues 418 387 Operating expenses (666) (616) Operating result (248) (229) Net income (loss) (311) (307) Key figures Reportable segments € mn three months ended 30 September 2014 2013 Holding & Treasury Operating revenues 100 82 Operating expenses (367) (320) Operating result (267) (238) Banking Operating revenues 273 258 Operating expenses (261) (254) Operating result 11 4 Alternative Investments Operating revenues 47 47 Operating expenses (39) (42) Operating result 8 5 1 Consolidation included. For further information about our Corporate and Other business segment, please refer to note 4 to the condensed consolidated interim financial statements.